Have you noticed seeing and hearing strange terms like frets, the nut, pots, bridge, saddle and pickups in your quest for guitar knowledge? Pickups? What is this, a new reality TV dating show? Playing a musical instrument introduces you to a new language with regards to terms and techniques, and guitar is no exception. Between identifying the guitar parts and understanding music notation and theory, things can get pretty confusing at times. Read almost any article in a guitar magazine and I can almost guarantee you'll need a dictionary before you reach the end of the page. To help you out, I thought I'd take some time each week and research for you common (or not so common) terminology you are likely to come across. Over time we should compile a good source of guitar lingo and definitions. You can send me your requests here. So let's start off with an easy one. If you look at the top of your guitar neck, up by the tuners (the keys/pegs you use to tune your strings), you'll see a bar that has all the strings resting on it. This bar is notched for each string. Located it yet? Just look at the end of the neck furthest away from you at the end of the fretboard. The thin block where the strings rest is called the nut. Why is it called a nut? Well, in German, "nute" means groove. The nut has a groove cut or filed out for every string, so it makes some sense, although it's commonly believed the modern six string guitar (classical) originated in Spain. One might expect the guitar nut to be called "cejilla", loosely translated to "capo", but "nut" is certainly easier to remember and say! All sorts of materials have been used over the years for guitar nuts - bone, metals, various plastics and other synthetic materials have found their way onto the guitar neck. Luthiers (guitar makers) are always on the lookout for materials to build better sounding guitars. So why is the nut important? The main reason is the fact that the nut is one of the two critical physical points from which the string will create sound. The sound you hear is the result of the vibration of the string, or the specific frequency of that vibration. When you pluck a string, it creates a sound wave by vibrating back and forth at a certain rate per second based on its tuning - the number of times it vibrates in one second is the sound frequency. For example, the standard tuned note 'A' has a frequency of 440 Hz (hertz), which means it vibrates 440 times per second. Without the two fixed points - the nut and the saddle or bridge - the string cannot vibrate, so no sound wave will be created. Think of a piece of yarn- if you hold one end and let the other end lay on the ground, there is no tension. Touch the yarn at any point between the ground and your hand and there is no resistance. If you tie the yarn to something and pull it tight with your hand, you'll now have resistance and can pluck the string to cause a vibration. The length of the string between the nut and the bridge is very important, because this allows for the starting point of the tuning process. The guitar is designed with a very specific distance between the nut and bridge so that it can be tuned properly. Combine that length with the string thickness and you have the elements present to create the proper pitch for each string. The tuning machines (keys/pegs) can only compensate so much for the pitch of the string - loosen too much and the string goes slack. Tighten too much and you run the risk of snapping the string or worse, damaging the guitar neck. So proper tension, combined with string thickness, length and fine tuning adjustments of the tuning machines, gives you the desired tuned pitch. Secondly, the nut keeps the strings aligned properly on the neck and helps determine string action. Each groove location is precisely measured before being cut into the blank (a nut without the string grooves). 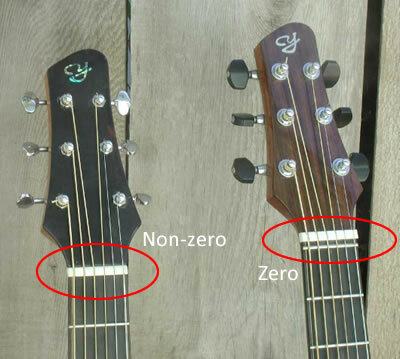 The height of a nut sets the starting point for determining the distance between the strings and the first fret. If the nut height is too short, action at the higher frets will suffer. If too high, you're playing slide guitar! 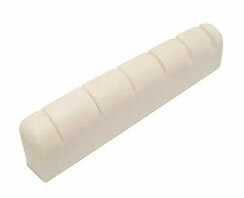 You can replace the guitar nut either by choice or because the nut has worn down. For example, I had a guitar where I replaced the original nut with a brass nut. Normally, though, you would only have the nut replaced when it has worn down and you're getting fret buzz or the string is laying against the first fret (unless your guitar has a zero fret - then it's normal for the string to rest against it). It's beyond the scope of this article to discuss the "how-to" aspect of nut replacement. There are many aspects to consider when choosing a nut - the material you want to use, the measurements for your guitar, whether you buy a nut pre-made or you make it yourself, how to make it, etc. Here is a great resource to get you started with do-it-yourself replacement of the nut, if you are so inclined. I also recommend the book "How to Make Your Electric Guitar Play Great - Second Edition", by Dan Erlewine. Not only is nut maintenance and replacement covered, but any guitar maintenance and repair issue you might find yourself dealing with. However, in most repair situations I recommend taking your guitar to a pro, at least the first time you look to attempt a repair. Ask if you can watch the process so you can determine if this is something you would attempt on your own. Better to have a guitar shop do the detail work than risk permanently damaging you guitar. Let me know if you have any questions. If you think you'd like to do guitar tech work, you might want to check out the Learn & Master Guitar Setup & Maintenance Course. I've not had the privilege of looking at this course, but I own another course from the L&M people and it is top notch (they've partnered with Gibson Guitar Company, so that's a pretty good endorsement). I don't think you'll go wrong if you invest in the program - You shouldn't have a guitar that's hard to play. And remember, my Rock & Roll homies, don't forget to keep your nuts in good working order!